The on going heat wave in Glasgow has brought people out, and with the crowds gathering at Commonwealth events, and the weather set to get even hotter this weekend is sure to bring out a great atmosphere in the city and some great sporting moments. 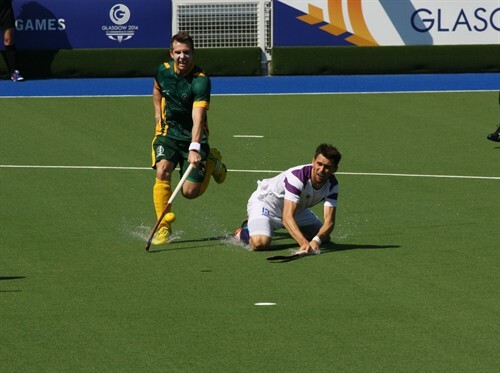 Day two of the Games saw our teamwear alliance partner Scottish Hockey in action as well as events in cycling, swimming and weightlifting to name a few. The Scottish Women's side took on Malaysia in Pool B of the competition with a 2-0 victory thanks to striker Ailsa Wyllie. A well earned victory and with Australia proving their next challenge on Sunday we are excited to see the side in action again. There was more success for Scotland in the cycling with Neil Fachie and his pilot Craig Maclean winning Gold in the para-sport 1000m time trail tandem. While Scotland's Dan Wallace won gold in the 400m Individual Medley and Sarah Clarke rounded the medals tally with a win in the 63kg Women's Judo competition. It was another great day for Team Scotland at the Games, and with the Rugy 7's competition kicking off tomorrow we are looking forward to not only getting to see our boys in blue in action but also seeing Uganda playing in the shorts we printed this morning. It is set to be an action packed day at Ibrox and we will be there to report on all the action.